LOCATION.--Lat 43°00'36", long 77°47'29" referenced to North American Datum of 1983, Monroe County, NY, Hydrologic Unit 04130003, on right bank 40 ft downstream from bridge on Union Street in Garbutt, 1.5 mi west of Scottsville, and 4.2 mi upstream from mouth. REVISIONS HISTORY.--WDR NY-82-3: Drainage area. WDR NY-71-1: 1960 (M). WDR NY-93-3: 1991. WDR NY-97-3: 1996 (P). GAGE.--Water-stage recorder. 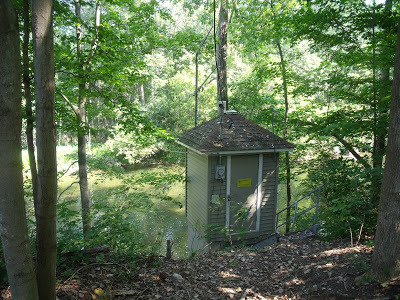 Datum of gage is 560.86 ft above NGVD of 1929 and 560.31 ft above NAVD of 1988 (VERTCON). EXTREMES FOR PERIOD OF RECORD.--Maximum discharge, 7,050 ft³/s, Mar. 31, 1960, gage height, 8.64 ft; minimum discharge, 3.3 ft³/s, Sept. 11, 12, 1958; minimum gage height, 1.88 ft, June 19, 1959, result of regulation. PERIOD OF DAILY RECORD1.-- WATER TEMPERATURES: October 1959 to March 1961. SUSPENDED SEDIMENT DISCHARGE: March 1975 to September 1977. INSTRUMENTATION1.--Automatic water sampler since July 1997. COOPERATION1.--Water-quality samples were collected by the Monroe County Department of Environmental Services and analyzed by the Monroe County Environmental Laboratory at Rochester, NY. Prior to 2003, water-quality samples were collected by the Monroe County Environmental Laboratory at Rochester, N.Y.
EXTREMES FOR PERIOD OF DAILY RECORD1.-- SUSPENDED-SEDIMENT CONCENTRATION: Maximum daily mean, 282 mg/L Aug. 17, 1997, minimum daily mean, 0 mg/L, Apr. 14, 1975. SUSPENDED-SEDIMENT DISCHARGE: Maximum daily, 2,980 tons, Mar. 5, 1976, minimum daily, 0 ton, Apr. 14, 1975.